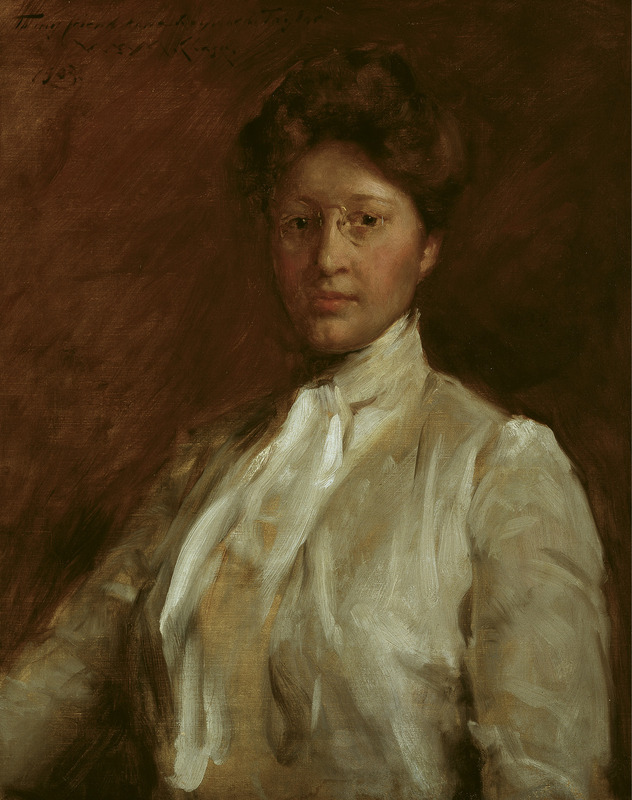 Taylor studied with renowned portrait artist and American Impressionist William Merritt Chase in Holland during the summer of 1903. Chase later visited her family in Columbia and painted three portraits of them, including this one of Anna. 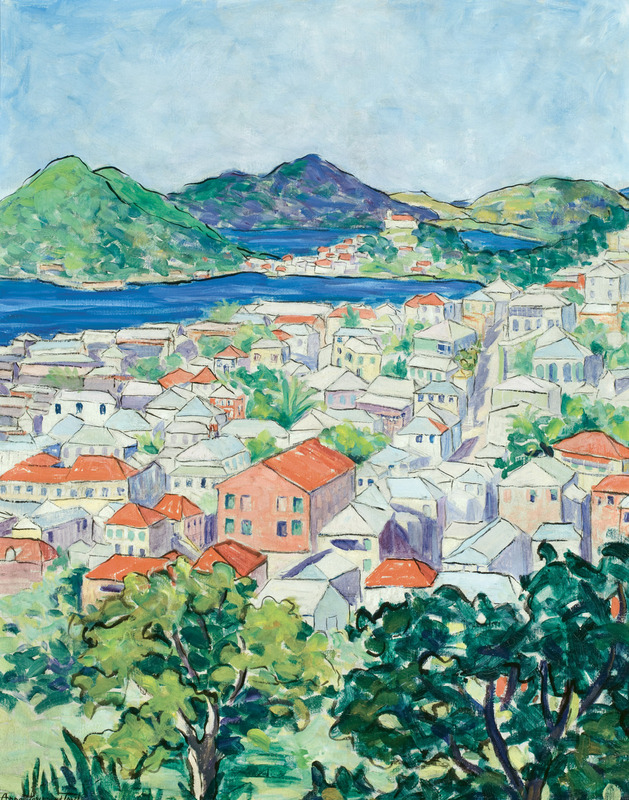 The artist donated several of her batik works, including this one inspired by her time in British Guiana, to The Charleston Museum in 1955. 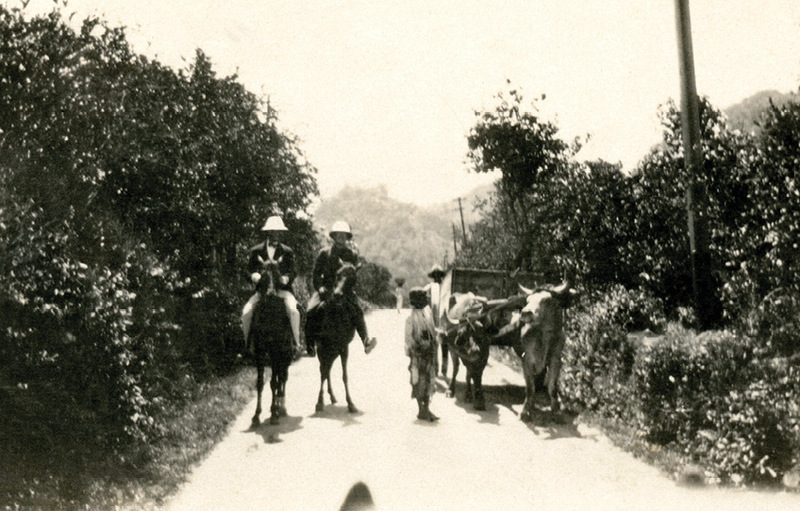 Taylor arrived in Georgetown, British Guiana, with Beebe’s expedition team in 1916. 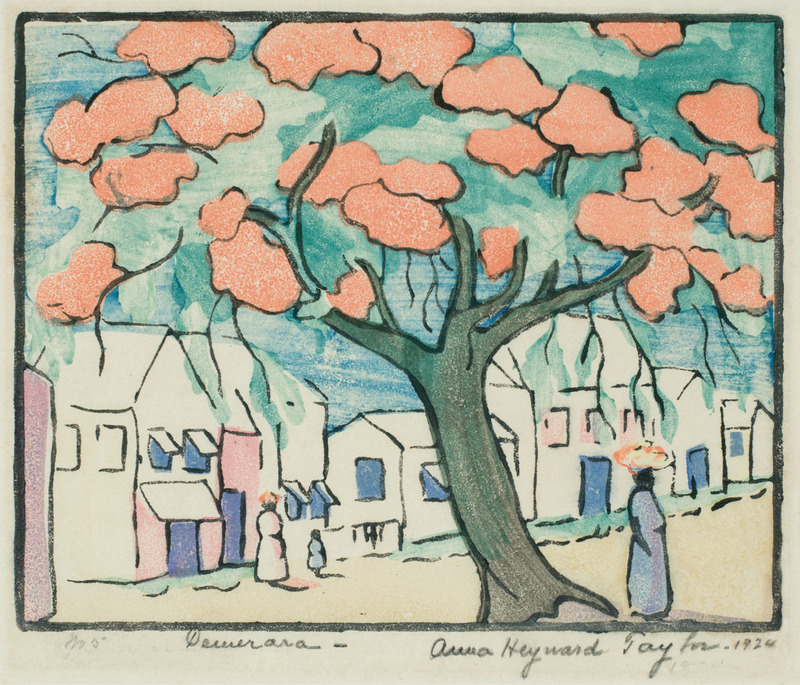 Eight years later, she produced this woodblock print on paper, titled Demerara for that region of the South American colony. 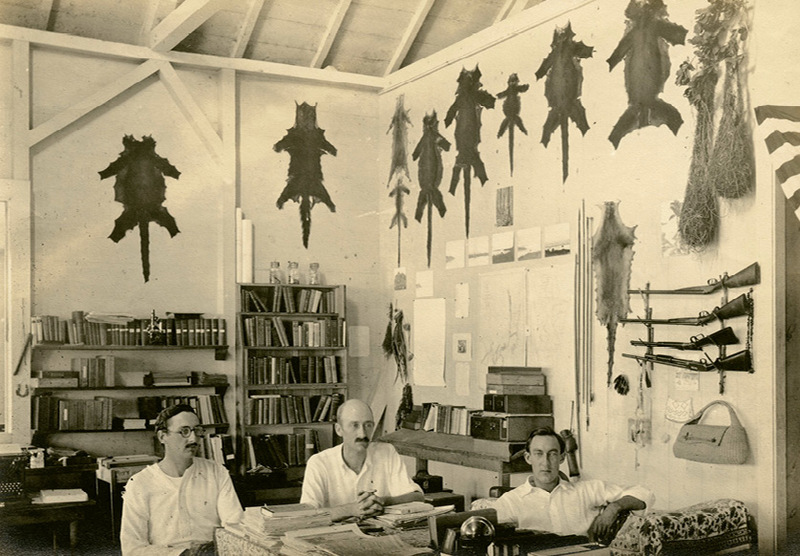 The skins of tropical wildlife specimens hang in the lab above Inness Hartley, William Beebe, and Paul Howes. 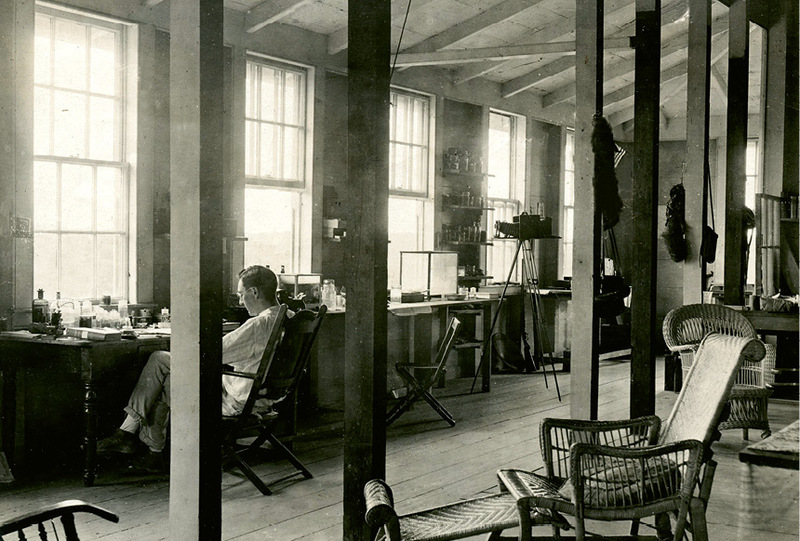 Inness Hartley at his desk in the lab. 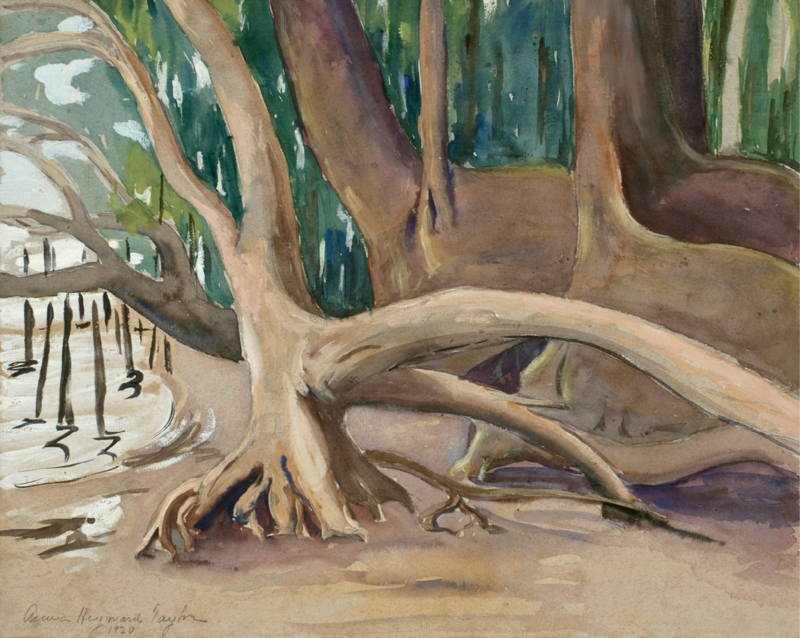 Untitled (Tree Trunks), a 1920 watercolor, represents the artistic freedom she experienced on her second visit to the colony..
At the onset of World War I, Taylor joined the American Red Cross—the first woman from South Carolina to do so—serving in France and occupied Germany. 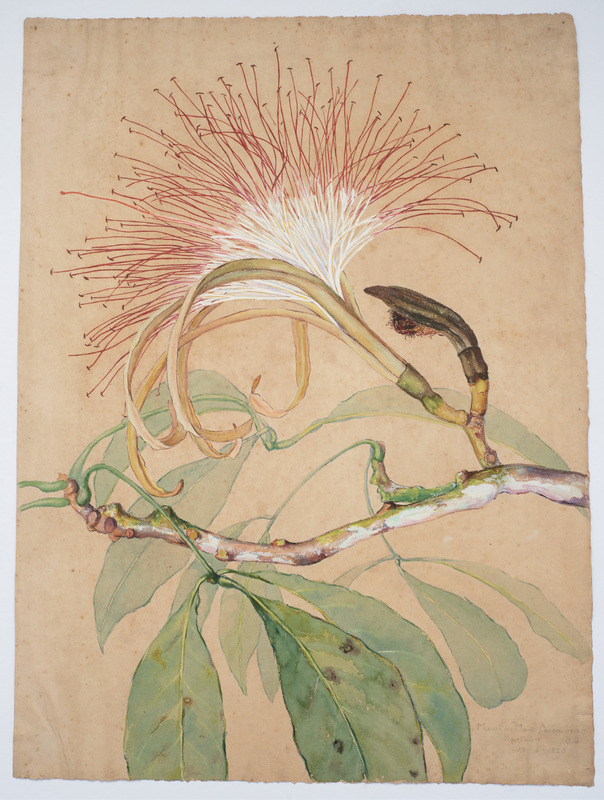 Taylor painted this detailed illustration of the cocoa bean tree’s branch, leaves, buds, and flowers from the jungles of Kartabo, British Guiana, in watercolor and gouache (Maw-a-maw, Cocoa bean, 1920). 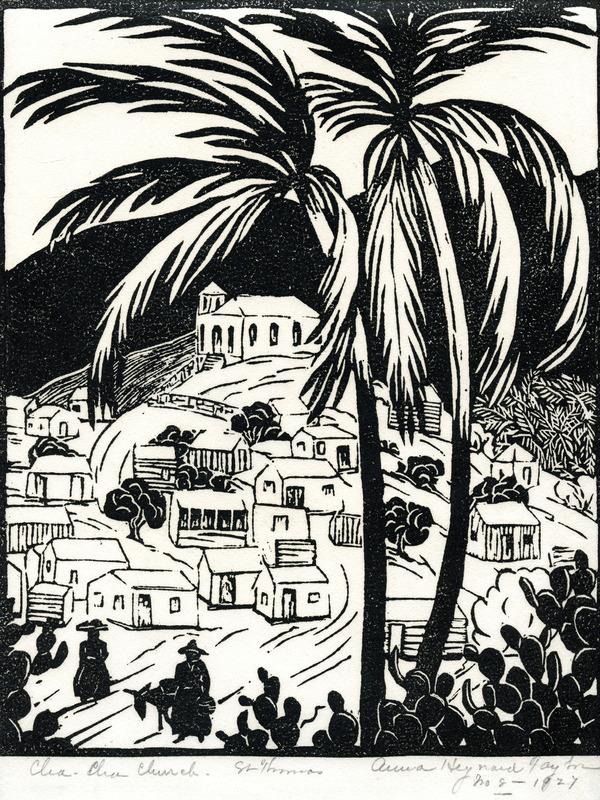 Two years after her 1926 visit to St. Thomas with Rachel Hartley, Taylor created this woodblock print, Cha Cha Church, St. Thomas, depicting the hillside of houses and a church at the top. 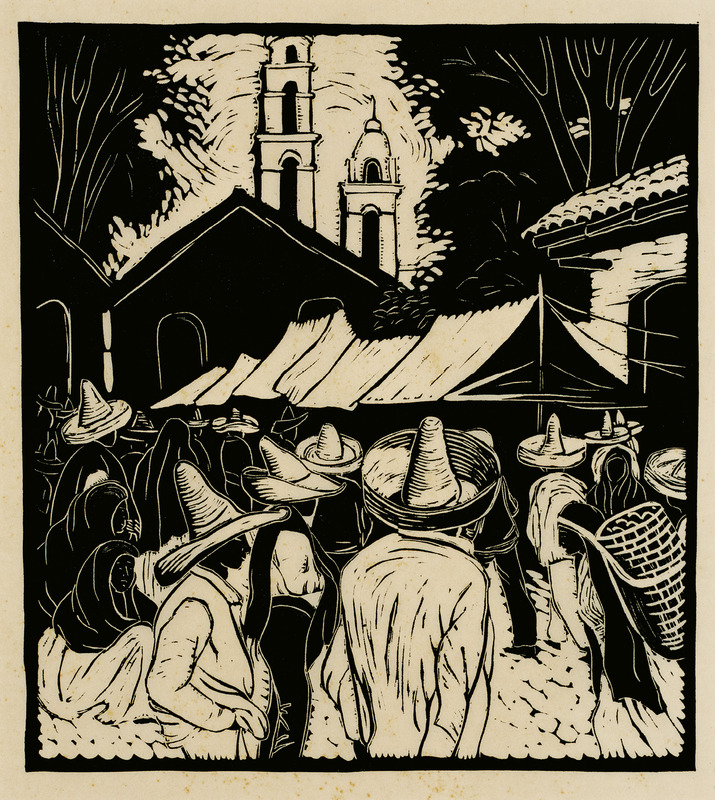 The artist traveled throughout Mexico from June 1935 to September 1936, capturing the culture and day-to-day lives of its residents in pieces, such as this “white line” woodblock print, Mexican Marketplace (circa 1935). 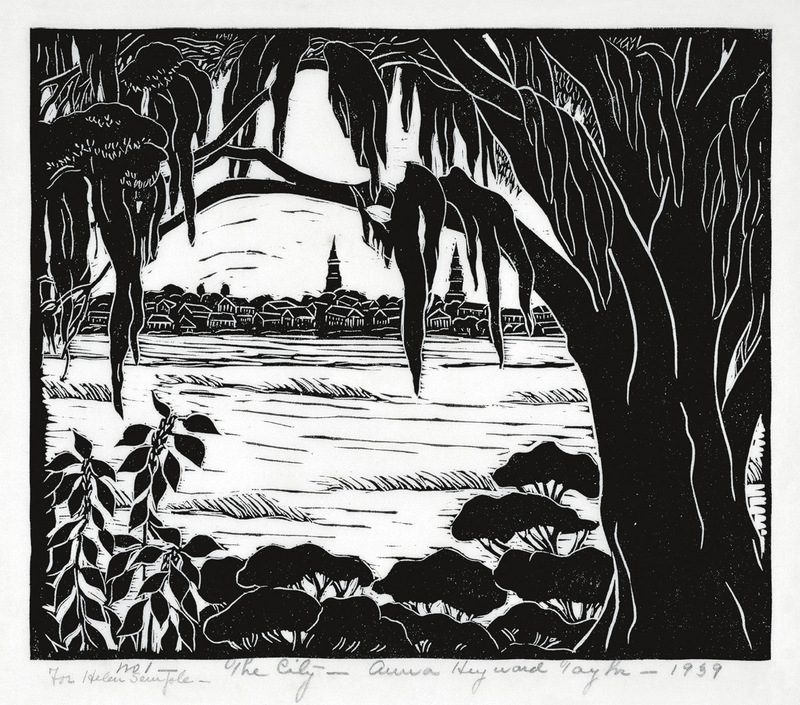 Taylor moved to Charleston in 1927 and produced numerous signature works of the region, including this woodblock print, The City, in 1939. The richness of color and rhythm of line in her watercolors, block prints, and batiks are what ultimately made Taylor one of the loftiest in the pillars of exceptional talent who were working in Charleston during the early 20th century, giving rise to the term “Charleston Renaissance.” Thriving on the wealth of material offered in the deep-rooted colonial city with its fluid pastels and panache, they included artists Alice Ravenel Huger Smith, Alfred Hutty, Prentiss Taylor, George Biddle, Edward Hopper, and Elizabeth O’Neill Verner, along with writers and poets John Bennett, Laura Bragg, Hervey Allen, Beatrice Ravenel, Julia Peterkin, and Josephine Pinckney. 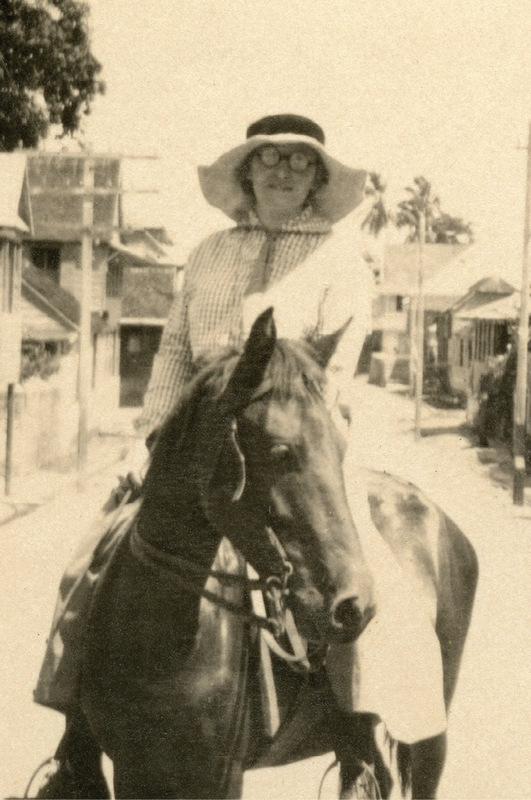 While all became celebrated in their own ways, Anna Heyward Taylor brought the unique sophistication of a world traveler. 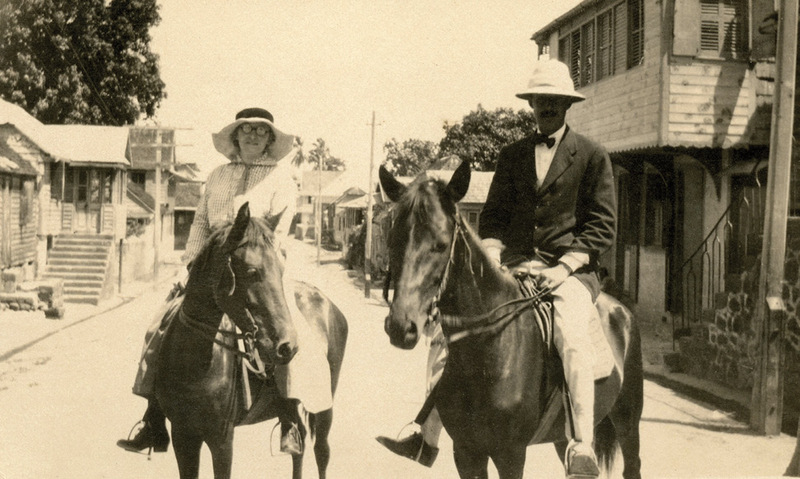 Her trips were not limited to Europe and England but extended to the Far East, the islands of the Caribbean, and the mountains of Mexico, as well as two expeditions with the celebrated explorer and zoologist William Beebe in the jungles of South America. That she made such journeys during the tightly corseted and silk-stockinged primness that marked a woman’s life in the early 20th century is even more of an accomplishment. Yet this natural boldness coupled with clarity of purpose was a hallmark of Taylor’s extraordinary life. Taylor was born on November 13, 1879, into a life of privilege. Her father was prominent Columbia physician Dr. Benjamin Walter Taylor, and her mother was Marianna Heyward, whose ties to South Carolina hearken back to Lowcountry planter and Declaration of Independence signer Thomas Heyward, Jr. Her paternal great-grandfather, Colonel Thomas Taylor, sold the land on which the city of Columbia was built following the Revolutionary War. 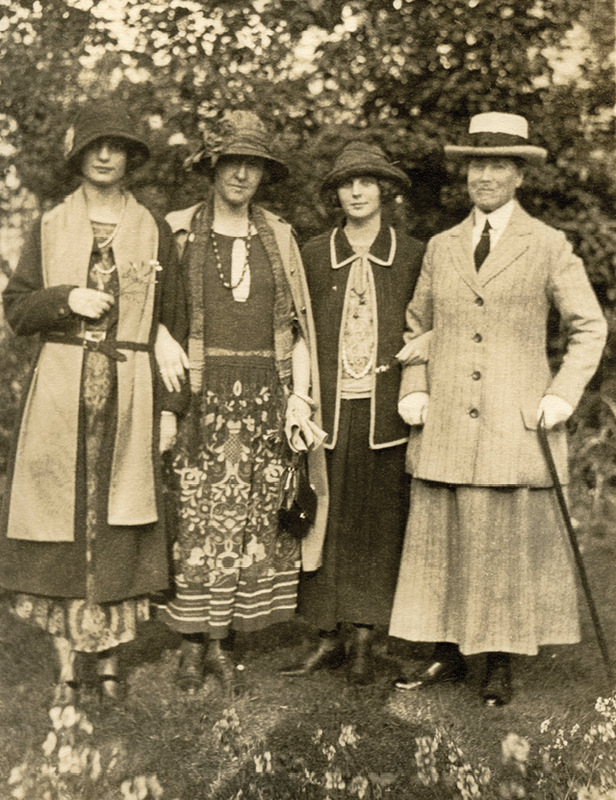 After graduating in 1897 from the Presbyterian College for Women in Columbia, by all custom she should have married a man of equal social position and settled into a quiet, comfortable life as a well-to-do society matron. Instead, she moved to New York, where she studied at the Art Students League and New York School of Art, where she became a pupil of Chase. She was only 24 when she traveled to Holland and London for Chase’s classes. For a good portion of her twenties, Taylor migrated between Columbia, New York, Philadelphia, and the summer arts colony at Provincetown, Massachusetts. During this period, she studied under a number of artists, including Frederick DuMond (1867-1927) and William Langson Lathrop (1859-1938). After a few years teaching art in Columbia, she and her sister, Nell, traveled to Europe together, with Nell studying voice lessons in Germany while Anna studied art in England, Scotland, Switzerland, and Italy. 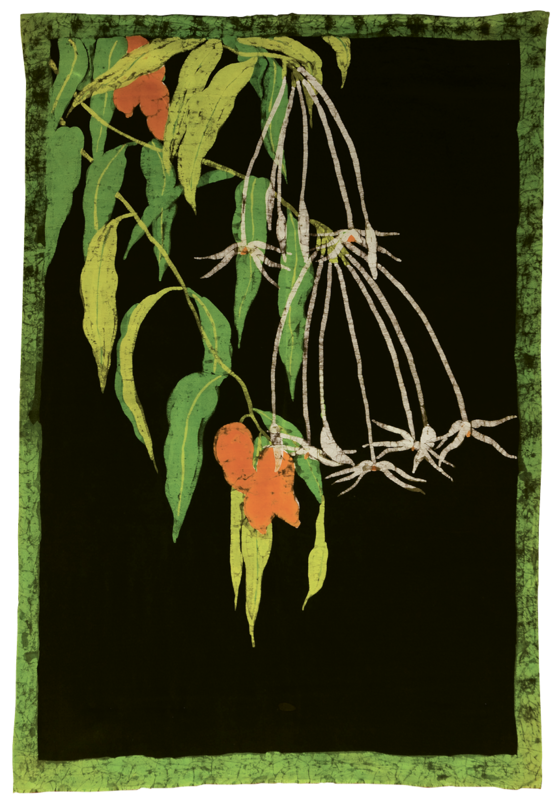 In 1914, Taylor journeyed to Asia, visiting China, Korea, and Japan, where she became keenly interested in the printmaking techniques and textiles that would make up much of her later work. It was then that she met artist Helen Hyde (1868-1919), who had been in Japan for several years and become a master of Japanese woodblock printing. 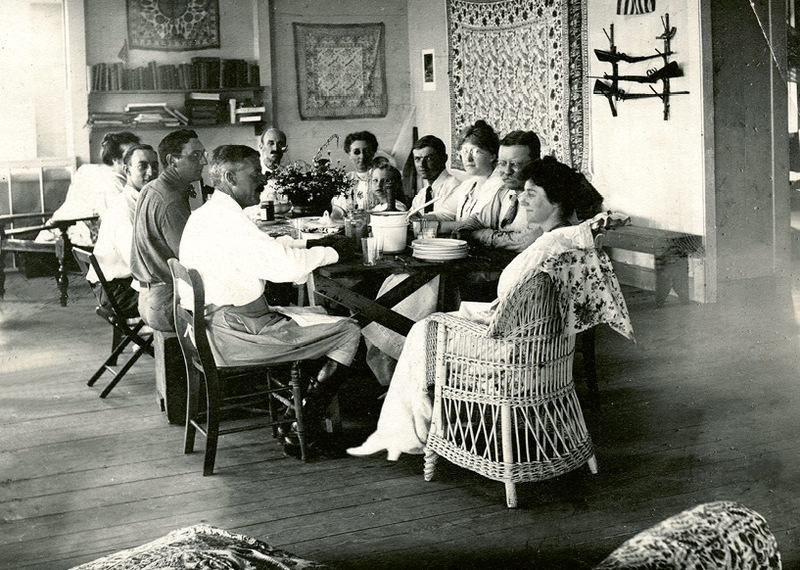 Back in Columbia, in December 1915, Taylor organized an art show for Hyde’s woodblock prints. She then introduced the artist to Charleston and helped her set up classes in print-making techniques. 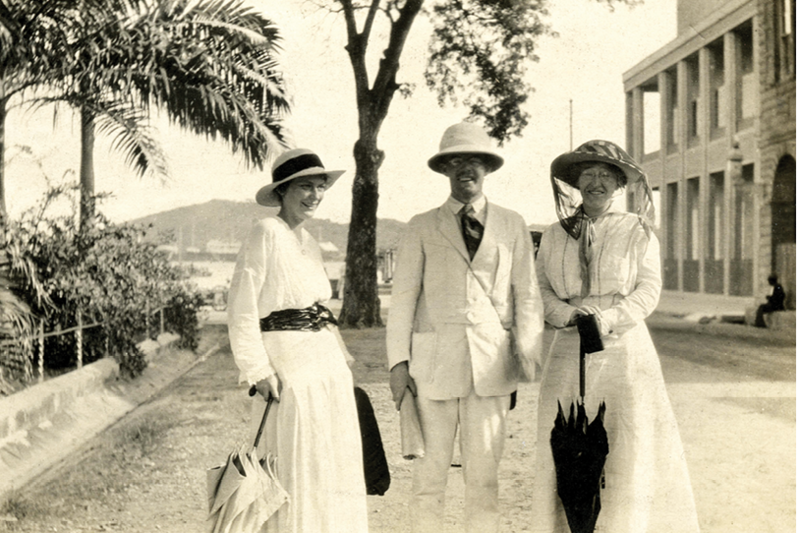 Taylor wouldn’t remain for Hyde’s instruction, however: she was traveling again, this time with her friends Rachel and Inness Hartley to South America by way of Grenada and Trinidad to work as a scientific illustrator at naturalist William Beebe’s “jungle laboratory” in British Guiana (present-day Guyana). Taylor had befriended fellow artist Rachel Hartley in Holland while both were studying with Chase. Rachel and her brother, Inness, were well placed in the art world: Their grandfather was landscape painter George Inness; their father, New York sculptor Jonathan Scott Hartley, helped establish the Art Students League. Inness was also a friend and research associate of Beebe. 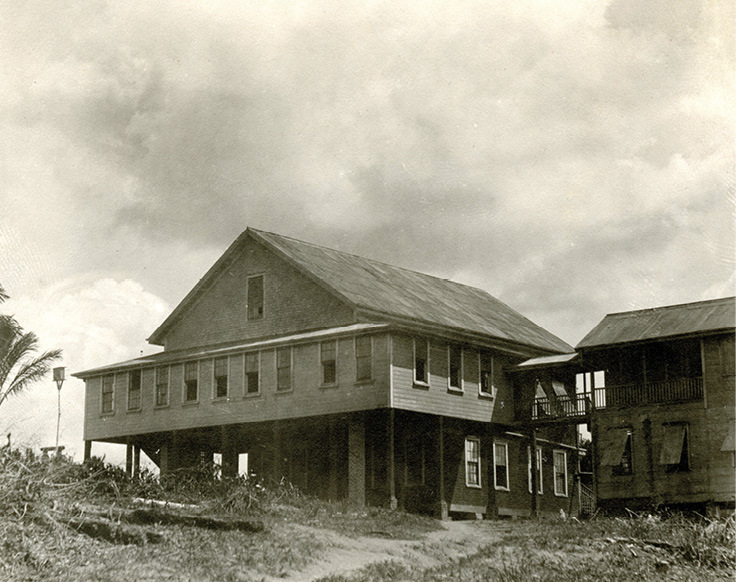 It is likely through the Hartleys that Taylor decided to join the Beebe expedition in British Guiana in 1916. In May, she returned stateside to spend the summer in Provincetown, where etcher and oil painter Bror Nordfeldt was experimenting with a revolutionary new method of “white line” woodblock printing. This process, which came to be known as “Provincetown Printmaking,” greatly streamlined the work and allowed the artist to make multicolored prints from a single carved block rather than having to carve separate blocks for each color used. A deeply carved groove separated each color, leaving a bold white line that also emphasized the design. While Taylor would later move to the less physically challenging linoleum block printing, the style became a hallmark of her work. 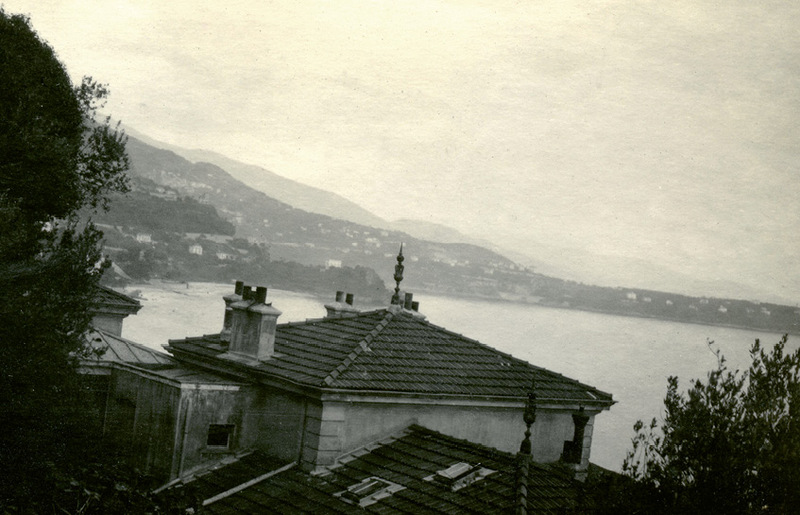 Even before she left Kartabo, she was planning upcoming exhibits using Bailey’s photographs. “This use of the scientific information to create art was highly original,” notes Moore. 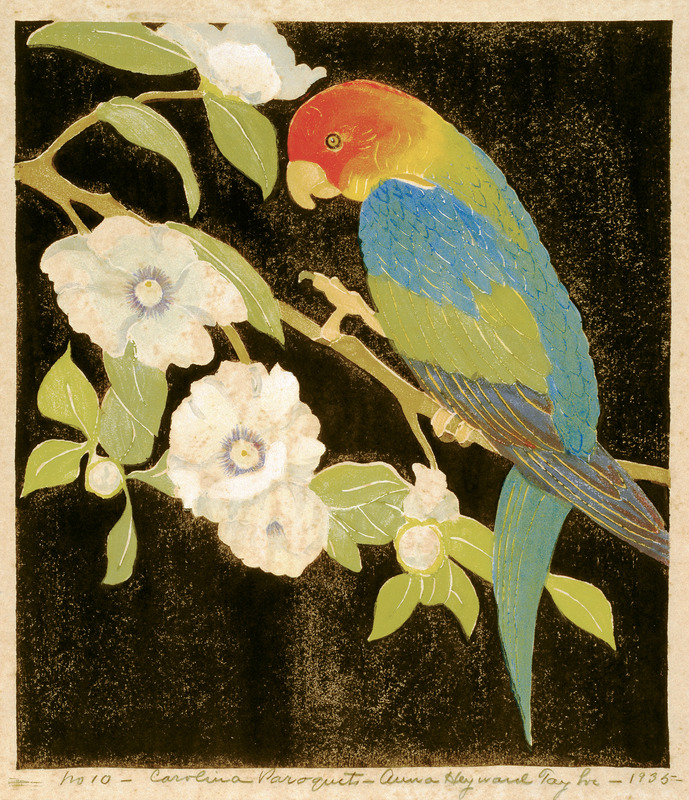 Indeed, in the spring of 1922, the resulting watercolors, batiks, and block prints were shown at the Museum of Natural History and Brooklyn Botanic Garden. 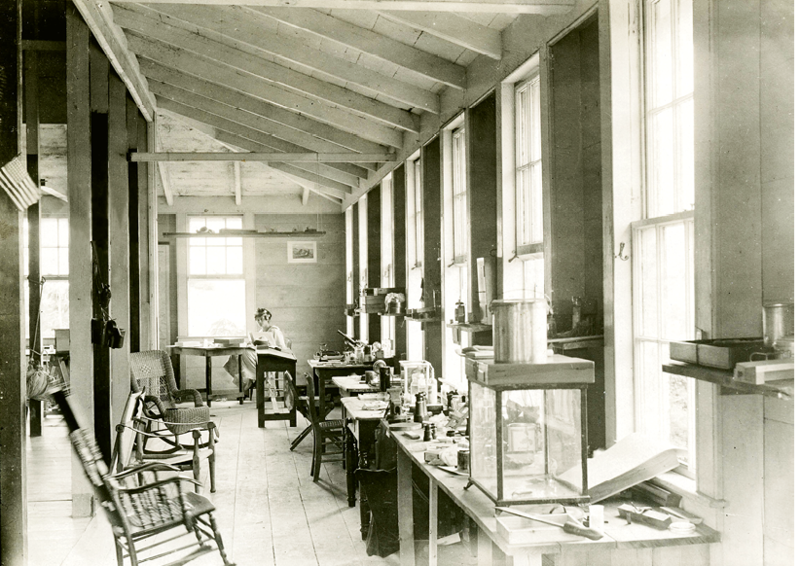 Taylor became known as “the jungle artist” and gave lectures to accompany her exhibits. She gained the reputation of explorer and later was welcomed into the Society of Woman Geographers. 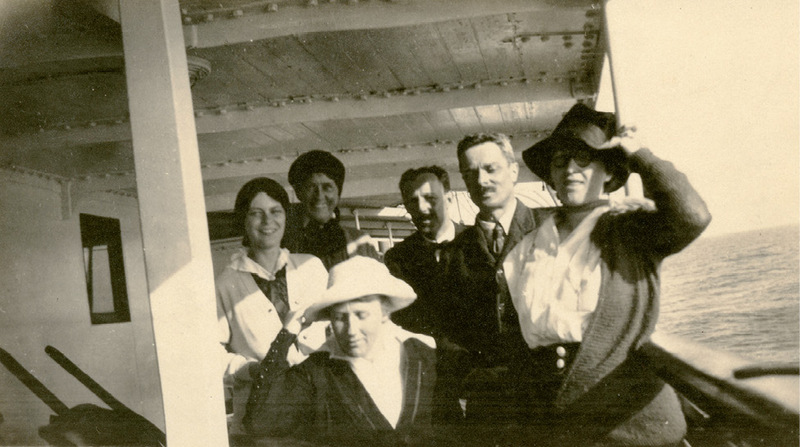 In 1925 she crossed the Atlantic yet again, this time on a three-month tour of Europe and the Mediterranean with her friend and artist Susan Greenough Hinckley Bradley, who, at age 74, was making her final visit to Europe. Taylor was now 47; however, her spark for discovery was not dimmed by middle age. 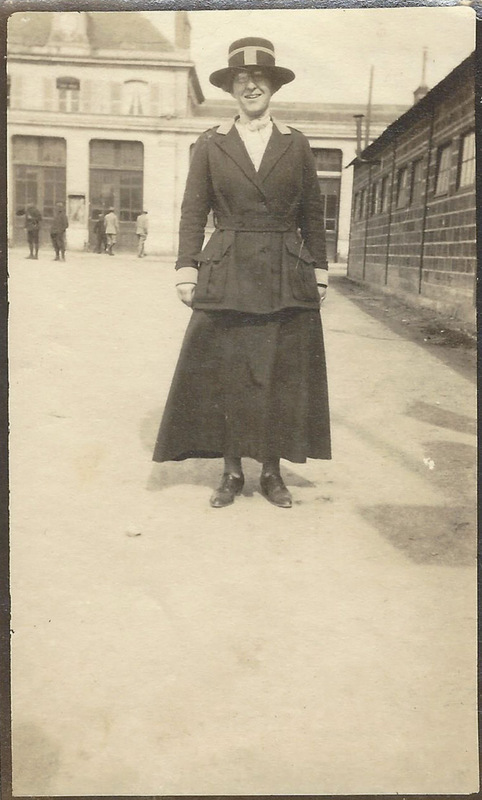 “I have been seeing some wonderful museums I never saw before,” she wrote Nell. More to the point, Taylor knew Charleston was the place to be. The Lowcountry had all the color, animation, and enthrallment an artist could desire. She quickly became an active part of the cultural scene of the Charleston Renaissance. In the bold strokes of watercolors and batiks and the dramatic black-and-whites of her block prints, she brought her own vision to the beauty of the natural world, the delicate whimsy of the town’s narrow streets, and lyrical portraits of its African American citizens. The remaining two decades of Taylor’s life were spent in her adopted city, Charleston. In 1948, she was commissioned to illustrate This Our Land, Chalmers S. Murray’s book on the history of the SC Agricultural Society. 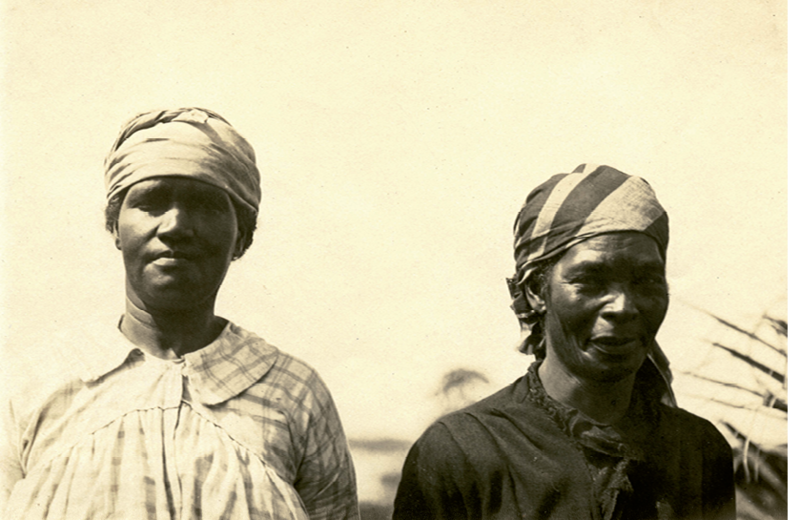 For it, she produced 23 dynamic black-and-white linoleum block prints showcasing Lowcountry plantation and farm life—the land and the people who worked it, the cotton harvesting, rice threshing, and carrying of crops to market. These prints became some of her best loved works and are now valued holdings in museums and galleries. 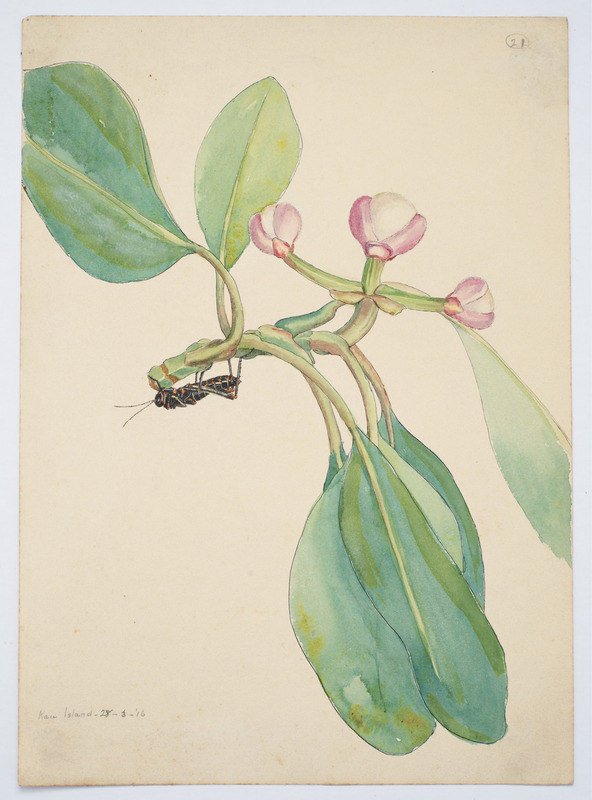 This is the first time that Anna Heyward Taylor’s British Guiana watercolors, batiks, and woodblock prints will be on view together,” says Gibbes Museum of Art exhibitions consultant Pam Wall, who, after years of research and a bit of sleuthing, was able to pull together this special exhibition. And so Wall’s vision for “Anna Heyward Taylor: Intrepid Explorer” became a reality. 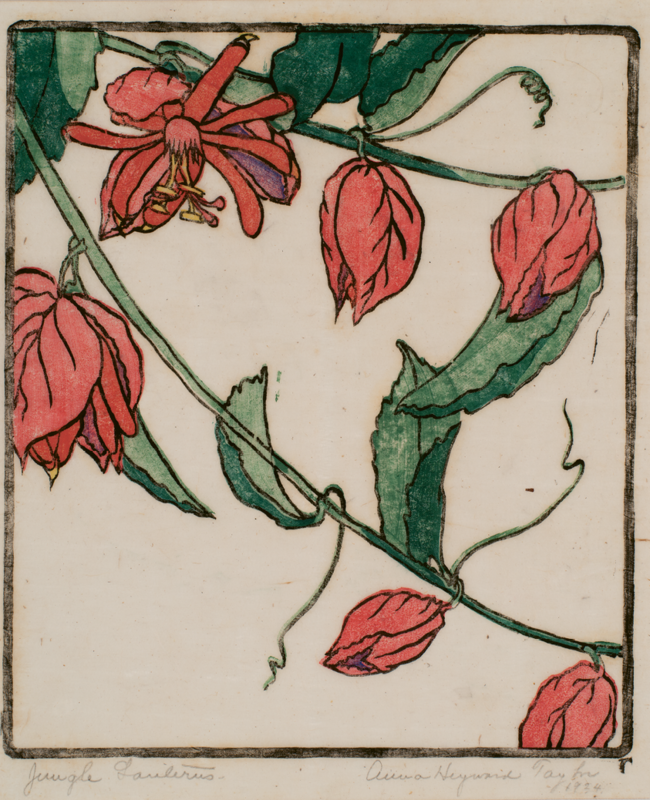 The exhibition features 30 objects from British Guiana (as well as Mexico and Charleston), including watercolors (eight on loan from The Charleston Museum), woodblock prints, two woodblocks, and a stunning batik. Curator-led tour: Thursday, January 24, 12:30 p.m.